July has been a fairly good reading month for me. I haven't been too busy, plus it was rather hot for most of the month and when it's hot I do tend to spend afternoons especially, quietly reading. 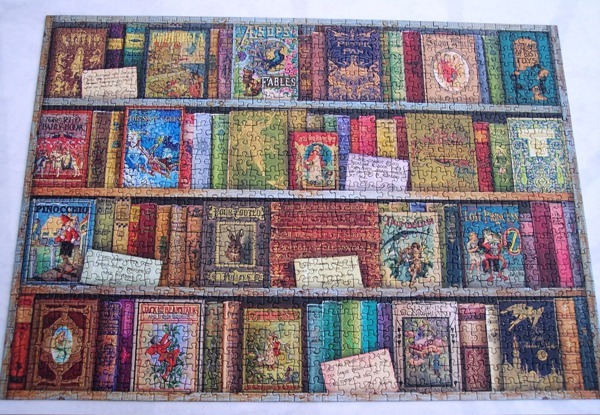 So, eight books read and most pleasing is the fact that half of those were non-fiction. Eleven-year-old amateur detective and ardent chemist Flavia de Luce is used to digging up clues, whether they're found among the potions in her laboratory or between the pages of her insufferable sisters' diaries. What she is not accustomed to is digging up bodies. Upon the five-hundredth anniversary of St. Tancred's death, the English hamlet of Bishop's Lacey is busily preparing to open its patron saint's tomb. Nobody is more excited to peek inside the crypt than Flavia, yet what she finds will halt the proceedings dead in their tracks: the body of Mr. Collicutt, the church organist, his face grotesquely and inexplicably masked. Who held a vendetta against Mr. Collicutt, and why would they hide him in such a sacred resting place? The irrepressible Flavia decides to find out. And what she unearths will prove there's never such thing as an open-and-shut case. Not much to say about this other than it was hugely enjoyable. It was delightful to return to the village of Bishop's Lacey and see once again how brilliant Flavia is at using chemistry to solve the various murders that crop up in the village. Her family and the cast of other village characters make the books come alive and they are just a joy to read. Can't wait for the next one now. 51. A Fountain Filled With Blood - Julia Spencer-Fleming. Oh, how I do love Clare and Russ. I think I may be reading these books as much for the progression of their relationship as for the actual crime element. The crime element is very good though, both books so far have had a long, really exciting scene towards the end to do with the landscape and conditions in New York State. I really love that real connection to the setting and love that I've found another author who does that. 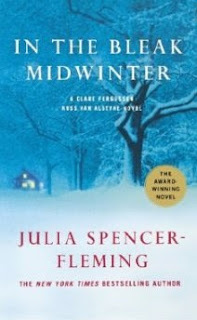 Others that spring immediately to mind are Craig Johnson, Nevada Barr, James Lee Burke (in the USA anyway). But Clare and Russ are fascinating. They're hopelessly attracted to each other but trying very hard not to be - Russ because he's married and Clare because she's a church minister and because Russ is married! It's absolutely fascinating. Great books, book four has arrived but book three has not. Wish it would hurry up! So, that's my reading for July. Pleased that I managed four non-fictions this month, I knew it was achievable if I put my mind to it. Favourite book of the month? Probably Crooked Letter, Crooked Letter by Tom Franklin, but the two Julia Spencer-Flemings ran it a close second and so did Travels With Macy and Notes from a Big Country. To be honest it really was a reading month full of quality books. 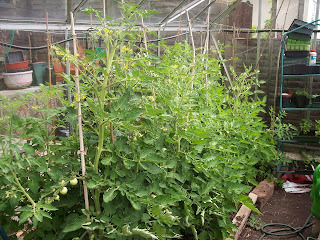 We had a huge downpour last night, the first proper rain in weeks and weeks which included quite a long heatwave. And while we don't tend to get heat or humidity on, say, the North American or Australian level, mid to high eighties for us in the UK is something we're not used to and some of us don't enjoy - me included! So it was lovely when it broke last night with quite a deluge and everything looks so different the morning after. 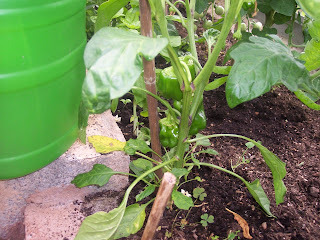 I couldn't resist taking a few pics of our veggies looking very grateful for their good long drink. 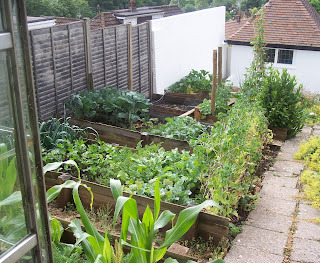 Our veggie garden is not huge, we don't need it for just the two of us, but one of the main reasons we're happy with it this year is that we didn't really get one last year. It was washed away by constant torrential rain and anything that was left was devoured by the plague of slugs and snails that the whole country suffered from in 2012. 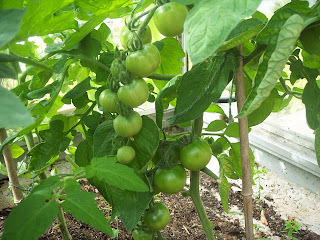 We got tomatoes from the greenhouse and a few peas and that was about it. 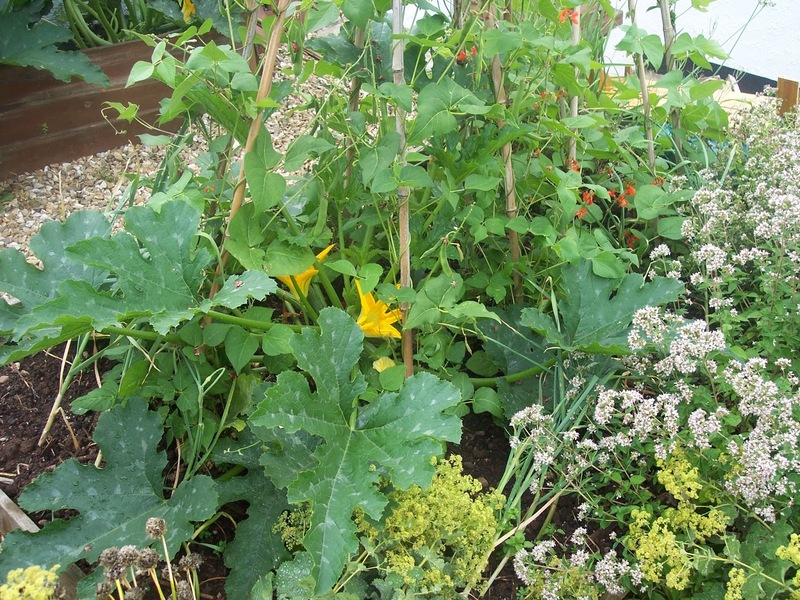 This year we have courgettes, runner and French beans, cabbages, sprouts, cauliflower which is now over and in the freezer, beetroot, shallots, swede, parsnip, leeks, carrots and more. Very pleased indeed. If you click on the following pics they'll come up bigger of course. 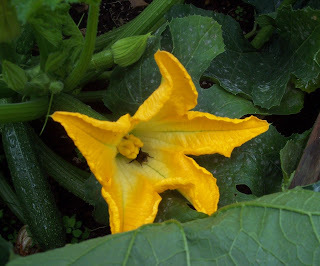 I love these blowsey, yellow flowers that the courgettes (elsewhere called zuccini I think) produce, this one has a bee in it. I only picked these yesterday and it looks like I need to do it again today. Brussel sprouts! 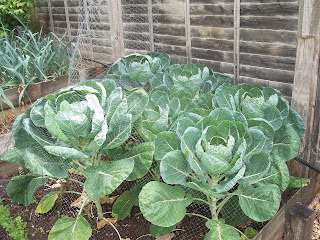 Good healthy plants but we're having the devil of a time keeping the cabbage white butterflies off. We have them netted but they still get in. 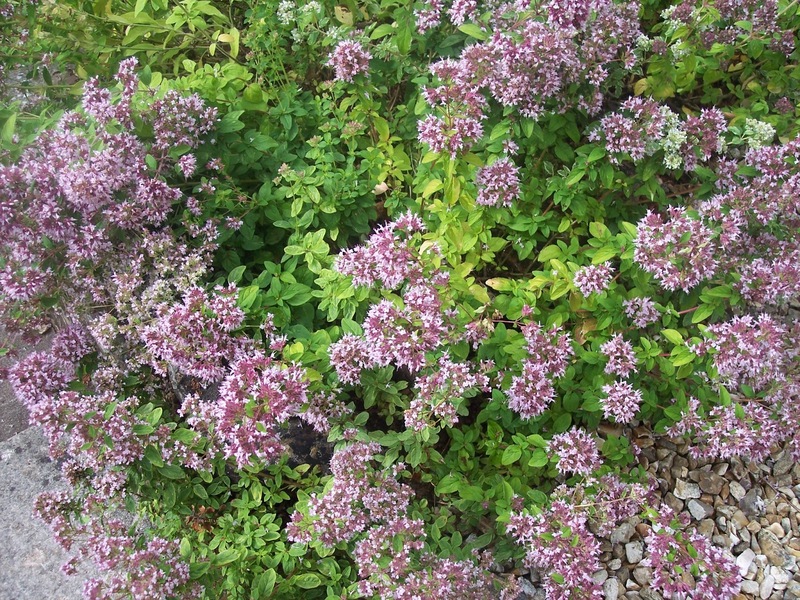 The flowering herb, marjoram. Fabulous for attracting the bees. It's usually covered but am guessing the bees were waiting for it to dry off a bit, looking out now they're there. Runner beans... not right against the wall as they seem to be... notice dark clouds... haven't seen any of those in quite a while. 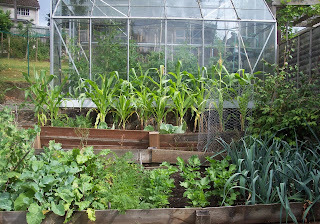 Honestly, I don't think a small garden like this is the best situation in which to grow corn-on-the-cob. But every year we give it a go. 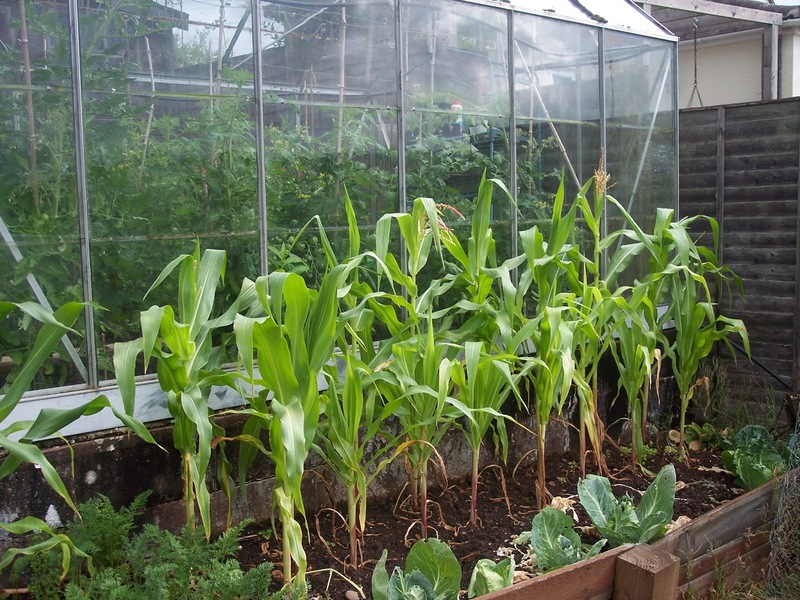 Last year we got nothing, usually they produce 3 or 4 cobs a plant, enough for some wonderful lunches and we freeze the remainder. We'll see what happens this year. 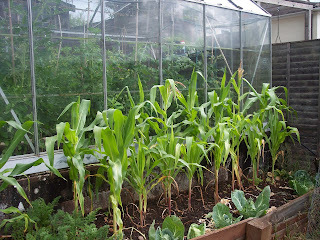 Inside the greenhouse. 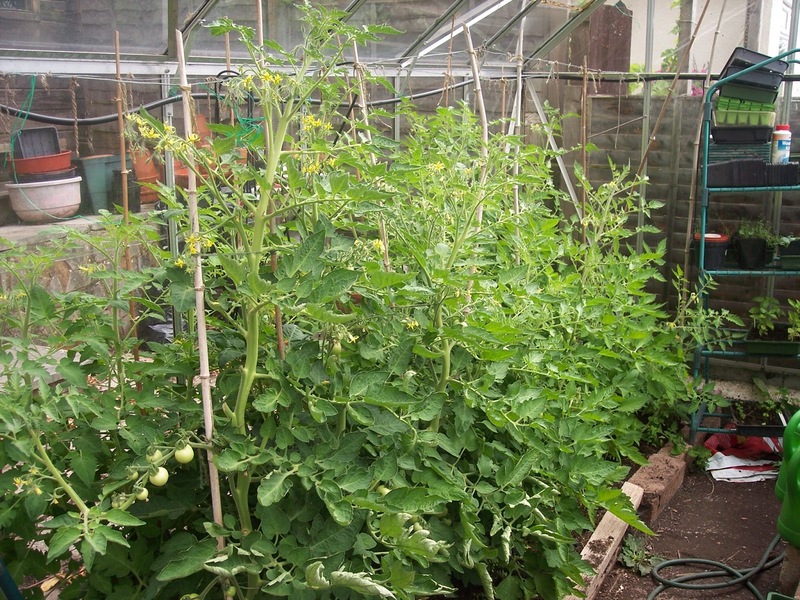 It looks like a forest of tomatoes when you get closer. Peppers. Still small, also not ideal for our climate, in my opinion but we like to give these things ago and whatever the two plants produce will go nicely in stews in the winter... even though I don't really like them. LOL. My husband likes to utilise every available space so here we have a courgette plant growing inside one of the runner bean wigwams. ... and over the hills and far away. I will confess here that my husband is the gardener, not me. I enjoy pottering and I tend to be the main harvester of whatever the garden produces... but he grows it all, not me. 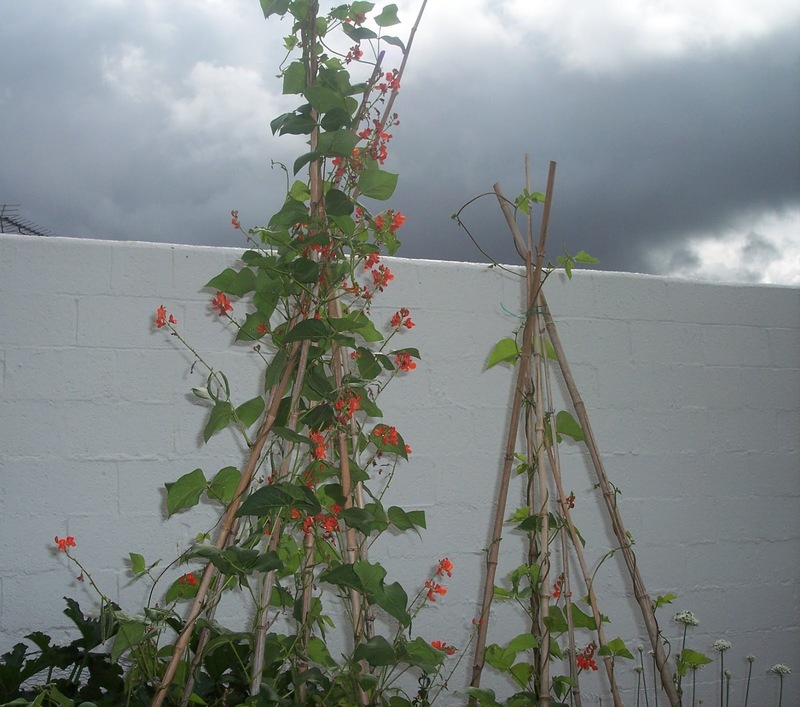 I am however grateful for a husband who loves to grow things to eat and always has. In just over a week we'll have been married 40 years and I can honestly say there has never been a year when he hasn't grown vegetables, *even* the year 2001 when he had a triple heart-bypass in August. I think I must've helped a bit more that year though. LOL! And that wasn't this garden either it was a much bigger one elsewhere. I've said before that I think that we live a sort of 1950s lifestyle where our lives are not centred much outside the home, but more concentrated on family, home, garden, books. We're a touch anti-social and we know it, but that's ok I hope. 40 years must mean it works for us! In a town in rural Mississippi a girl has gone missing. It seems this exactly mirrors an event some 25 years ago when another girl, Cindy Walker, also went missing. The man who was suspected of abducting and probably murdering this girl was Larry Ott, at the time aged sixteen. But he was never tried, for lack of any real evidence aside from the fact that he was the last person to see her alive. The town has tried him in their own minds though, found him guilty and ostracised him for all these years. It seems fairly obvious to one and all that once again Larry Ott has abducted a young girl. One of the town policemen is Silas Jones. He and Larry Ott were childhood friends back at the time Cindy disappeared, an unusual thing then as Larry is white and Silas black. It was at the time when the schools were being desegregated and the school had mainly black kids with a few white. Larry was not popular, not really because of his colour but because he was different, a reader of Stephen King novels, not particularly sporty, a bit awkward, and so on. What surprised me, when I realised it, is that of the almost fifty books I've read since the start of the year, three of the very best are the three I've read so far for this Southern Lit. challenge. Now why's that? It's odd. I can't decide whether it turns out this subject of the history of black Americans is something which fascinates me so much that any book about it can't fail. *Or* the standard of writing by southern authors or authors who tackle the subject is particularly high. I just don't know. 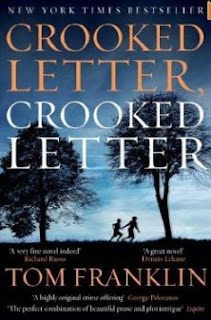 All I can say is that Crooked Letter, Crooked Letter is an amazing, fantastic book. It's not at all a sensationalised book. It doesn't scream hysterically from the rooftops how terrible things were twenty five years ago, it just tells you in its own quiet way that there was ingrained prejudice and that things happened which shouldn't have. But there is another story, that of a white boy, loved by his mother but otherwise not wanted by anyone, even his own father, and who people mentally tried and convicted even though there was no evidence that he'd done anything. People can be devastatingly cruel... people of all colours and creeds. I loved the fact that the story was told from two different points of view. Larry's sad life was heart-breaking, Silas was more complicated, it was quite clear he had things he didn't want to think about and was being driven by guilt. The story is also told in flash-backs. I'm not a huge fan of that style of writing but it works superbly here and doesn't half give the reader a history lesson! 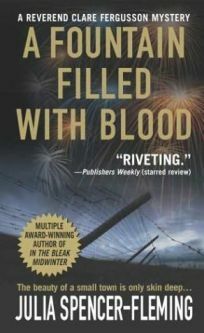 It reminded me a bit of Kathryn Stockett's The Help, another book where you're told matter-of-factly about a very unpleasant period of history and the author gives the reader credit for having the intelligence to draw conclusions for her or himself without whacking you around the head with sensational facts. This is a crime book but it's almost as though the crime takes a back seat to the retelling of the history of the lives of the two main characters. It's always there in the background, the reason the story is being told, and yes I wanted to know what had happened to the two girls. But I was much more interested in the human story being recounted and I'm sure this is why this book worked so well for me. I'm not surprised Pat, my husband, and youngest daughter liked the book so much. It was clever, humorous, informative, absorbing, heart-breaking. Loved it to bits and am sure it will make my top ten for this year. Of the four books I've read so far this month three have been non-fiction. I'm so pleased about this as one of the things I wanted to do this year was read more factual books. I started out well at the beginning of the year, tailed off a bit, but am now firmly back on track. Exactly a quarter of the books I've read this year have been non-fiction. I'd like to up that to a third really, but we'll see how it goes. Anyway, I'm going to do quickie reviews of said three books from this month. 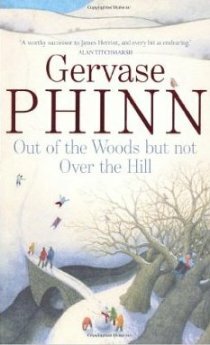 First up, Out of the Woods but not Over the Hill by Gervase Phinn. I took this back to library and it's faded from my memory a bit, so I'm going to use Amazon's synopsis to describe it. For Gervase Phinn growing old is not about a leisurely walk to the pub for a game of dominoes or snoozing in his favourite armchair. As this sparkling collection of his very best humorous writing shows, he may be 'out of the woods' but he is certainly not 'over the hill'. Looking back over more than sixty years of family life, teaching, inspecting schools, writing and public speaking, Gervase never fails to unearth humour, character, warmth and wisdom from the most diverse of experiences, whether they be growing up in Rotherham with the most un-Yorkshirelike of names or describing why loud mobile phone users get his goat. Brimming with nostalgia, gently mocking life's absurdities, never shy of an opinion, this is Gervase Phinn at his wittiest, twinkly-eyed best. I couldn't have put it better myself. *g* At some stage I ought to start another one of my lists and it should be entitled, 'Books that will make you laugh when you need cheering up'. 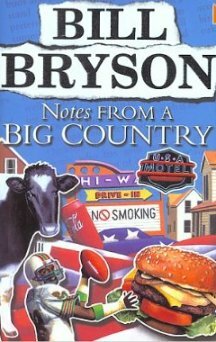 They would include books by Bill Bryson and Clive James but also this author, Gervase Phinn. He's written quite a number of books up to now, charting his life from childhood to old age in the Yorkshire Dales. He was a teacher who became a school's inspector and then turned his hand to writing autobiogrpahical books and poetry, very, very successfully; I think his books are probably well known world-wide as well as in the UK. This particular book is mostly an anthology of bits taken from his previous books. I've only read a couple of those so can't judge how much this is the case but judging from a few Amazon comments there isn't a lot of new stuff in it. That didn't matter to me - I thoroughly enjoyed the whole thing and laughed happily all the way through. There were stories of hardship that brought a lump to my throat, I hate to hear of abused or neglected children, it's my 'thing' and I find it hard to cope with. But that's life and it's not all beer and skittles and no-one knows that better than Gervase Phinn. I thought this was a gem of a book and heartily recommend it if you've not already read all of his previous books. Next, A Cook's Year in a Welsh Farmhouse by Elizabeth Luard. In an old farmhouse on the slopes of a mountain lying between Tregaron and Aberystwyth, Elisabeth Luard brings the produce of the land into her kitchen and turns it into delicious food. 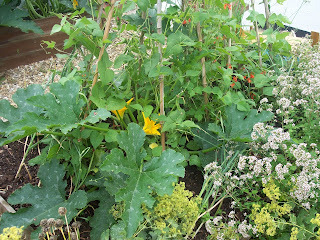 This book is her response to the changes she sees in her garden and the surrounding countryside throughout the seasons, with distinctive recipes at the end of each month's chapter. It is the story of a year spent planting and picking in the garden, roaming the countryside with her grandchildren and introducing them to the pleasures of rural living. I got this from the library but am thinking seriously of getting my own copy as it was a delightful book. It includes not just some excellent recipes but also a monthly narrative on seasonal food, what's available from her garden and also in the hedgerows. 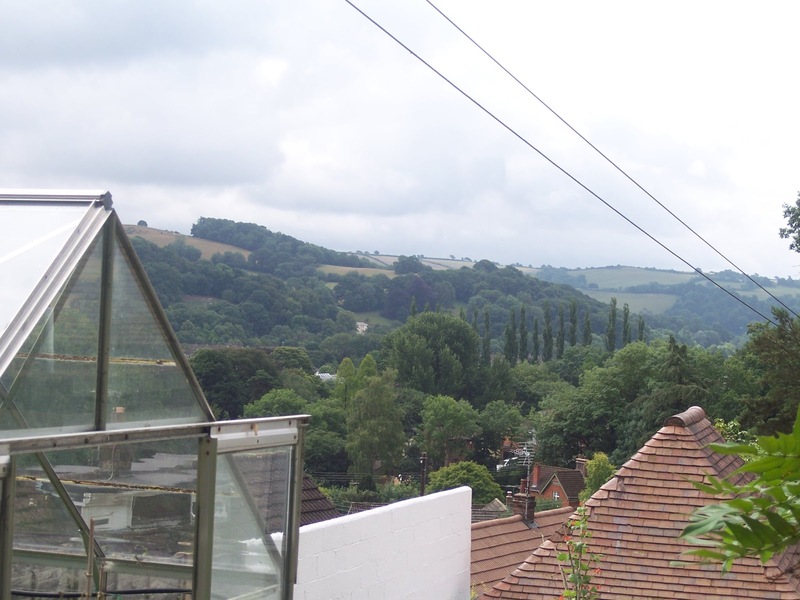 We hear about her neighbours, life in an isolated Welsh farmhouse, and also her grandchildren who come to stay a lot. It must be idyllic for them to run wild around the area but also to have such a lovely grandmother who cooks with them and takes them on foraging trips. It helped that I know Wales a bit and could picture the author's wonderful descriptions of the landscape around the house, it's a beautiful country and not far from us so we go quite a lot. Elizabeth Luard has a number of books available including autobiographical titles and other cookery books that mainly concentrate on European cuisine... French, Spanish, Italian and so forth. I may see if the library has any of those as, by the sound of it, she's led a very interesting, if not always easy, life. 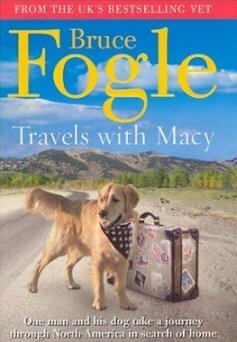 Lastly, Travels with Macy by Bruce Fogle. Well, last month I read the second of Bruce Fogle's travlogues, A Dog Abroad, about his travels around Europe, and here I am just finishing the first. I hadn't been aware when I read A Dog Abroad, that a few years earlier he'd taken his lovely golden retriever, Macy, around the USA and parts of Canada. When I discovered that fact I was delighted as I had loved the European book so much and wanted to read more of the author's work. Travels with Macy is so named because of John Steinback's book, Travels with Charley. Part of the reason for this trip was because Fogle wanted to retrace Steinbeck's steps around the USA in the 1960s. 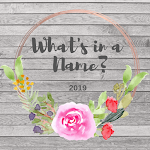 But also, him being a Canadian, albeit one who has livedin the UK for 30 years, he wanted to find out if he was completely Anglicised or whether he was still a North American at heart. The trip is undertaken in a GMC, a vintage camper van to us in the UK, and this becomes the author's home, with Macy, for the next ten weeks as he heads from Maine into Ontario, around The Lakes and across the northern states of the USA to Washington State, Oregon and so on. I have to confess here that I've not read Travels with Charley, so it's hard for me to compare the two books, but I gather Steinbeck was disappointed with much that he saw and discovered. The same could definitely not be said of Mr. Fogle. His taste for adventure and for meeting new people shines out of this book. The dog, Macy, is completely adorbale and was admired and petted all around America. America itself is the America that my husband and I came across on our travels. By that I mean the wonderful landscapes and warm and welcoming people. People who were interested in us and where we came from, what we thought of the USA, and to help us make the most of our holidays. The author thought he was going to find an insular people but found completely the reverse - an openess and kindness in strangers that he'd not expected. I could say I was surprised too, but it would be a lie. We didn't have quite his experiences over there but time and again we struck up conversations with complete strangers and enjoyed them so much we remember them to this day. What he did appeals to me, I must say, but I don't think I could be away from my daughters and grandkids for months on end like that. Apparently around 3 million Americans have sold their houses and live permanently in what they call RVs and we call camper vans. While I couldn't be without a permanent home to go to, I do understand completely why they've done it, especially in the USA and Canada where I would imagine you never run out of places to go and things to see. Wonderful, wonderful book, I plan on buying my own copy of both the author's travelogues and am hoping there will be more from him. Summer has arrived here in Devon, too hot for me to be honest, but others love it so I am not complaining (much). Instead I'm reading books about winter! In the Bleak Midwinter by Julia Spencer-Fleming is book one in her Clare Ferguson/Russ Van Alstyne series, set in upper New York State. The case is complicated. The obvious suspect for the murder is the baby's father but who is it? There are many possibilities, her ex-boyfriend, the husband of the couple the girl wanted to have the baby, an 'unknown' new boyfriend... even her own father it seems. Clare gets very involved and Russ can't decide if this is a good thing or a bad thing. Then another body turns up and the repercussions bring Clare's own life into jeopardy in ways she could never have imagined. Well, goodness, several people have recommended this series to me over the years. One of those cases where I've said to myself, 'Yeah, yeah... I'll get to it one day'. Now of course I wish I'd got to it a lot quicker! For a start it has the most wonderful setting of upper New York State. We went there in 1996, stayed in a skiing lodge in the Adirondacks, headed across to Vermont and New Hampshire and then back via Albany and The Finger Lakes. It's a glorious, heart-breakingly beautiful region and this book took me back seventeen years to that particular US trip and made me want to go again. Not sure December would be the best time to go though, it sounds like a hard place to be at that time of year. Though the idea of hibernating through the winter in a log cabin in the forests and mountains with loads of books and a roaring fire does quite appeal. I liked Clare very much indeed. She's a tough cookie who's known tragedy in her life and like many women had to adjust early to not being tradionally beautiful, so used her brains to make a life for herself. She's clearly attracted to Russ, and he to her, but she has morals and good for her. It'll be interesting to see how that pans out in subsequent books. I like Russ and I like the supporting cast, particularly the two secretaries, Harlene and Lois, who are the source of some nice humour in the book. The mystery itself had me flummoxed most of the way through, I suppose it became clear who the culprit was when it was supposed to, so that means it worked very well. The book is well written, 'intelligently' written, which I like. There was no rushing through this, it took me several days to read and I would not describe it as a 'cozy', though it's not hard-nosed either. To be honest, for me, it was a perfect little book. After abandoning two books over the last week or so it was so nice to find a little gem to immerse myself in. I have book two on reserve from the library but that's all they have... I'm pretty sure I will be buying the rest.